Meteorologically speaking, it’s not chilly, but whatever the weather, it’s always a good time for a bowl full of chili. Chili is one of those fantastic dishes that requires little effort and can be made by anyone regardless of her culinary skills. With the burner on medium, heat about a tablespoon of extra virgin olive oil in a big pot. And by “big” we mean about an 8-quart vat. Add to that a chopped onion and a couple of cloves of minced garlic. (If you’re in a rush or onions make you weep, keep frozen onion and garlic on hand for recipes like this.) At this point, we add in frozen corn kernels or chopped bell peppers. Stir the veggies so that they don’t burn, and then add about a pound of 80/20 ground beef or ground turkey. We enjoy chili with ground meat, but if you prefer vegetarian cooking, just leave out the meat. Once the meat is browned, add a 15-oz. can of diced tomatoes, an 8-oz. can of tomato sauce, one bay leaf, one or two cans of black beans and/or pink beans, 4-oz. of tomato paste, 2 teaspoons of chili powder and 1 teaspoon of salt (or more if you used “no salt added” canned products). Simmer the chili covered on low heat for ½ an hour or more. All of the above are suggested ingredients. We like lean meats for their high quality protein and iron, we add more beans for fiber and folate (particularly black, pinto and kidney), and all the tomato products add flavor, texture and lycopene. The red “stain” that tomatoes and tomato sauce leave behind is evidence of the lycopene, an antioxidant with cancer preventing benefits. Chili is also a simple vegetarian entrée, and soy products could easily substitute for ground meat. What goes great with chili? Beer! What goes great with chili for ALL family members, including those under 21? Honey cornbread muffins! We love the Neely’s recipe, and we substitute low-fat milk for the whole milk. What do you like to put in your chili? We want to know! 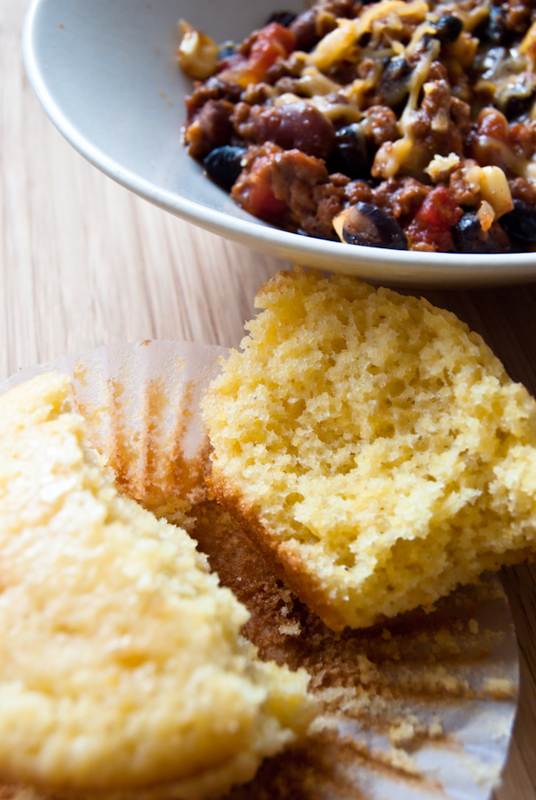 Please leave us a comment with your favorite chili add-ins! How Stacey Got the Shot: With the kit lens that originally came with the camera. ISO 800, focal length 34mm, f/8, 1/60 second. Used natural light and bounced it with white foam core. Beautiful shot and a heartwarming meal! looks like an awesome recipe! I will definitely try it :). Is it possible for you guys to add in how many people the recipes will serve? I regularly cook for a lot of people and I need to know if I’ll have enough to go around. Thanks! Rosy – Those are great ideas! The hot yellow peppers sound spicy and delicious. I forgot to mention that sometimes I use “picante” tomato sauce from time to time, and that spices things up a bit while not knocking my socks off. Thanks for your comments and tips! Lauren – That’s a great suggestion. We’ll be sure to note serving sizes in the future. This recipe serves about 6-8 people. It freezes well, too, so don’t worry about making too much! Looks good, but where’s the football!?!? The Neely’s are so annoying but they do make some good comfort food! We like ground beef, canned fire-roasted tomatoes, black beans and LOTS of Fajita seasoning in our chili. Found you through Blogs With Bite. A hearty congrats on that! 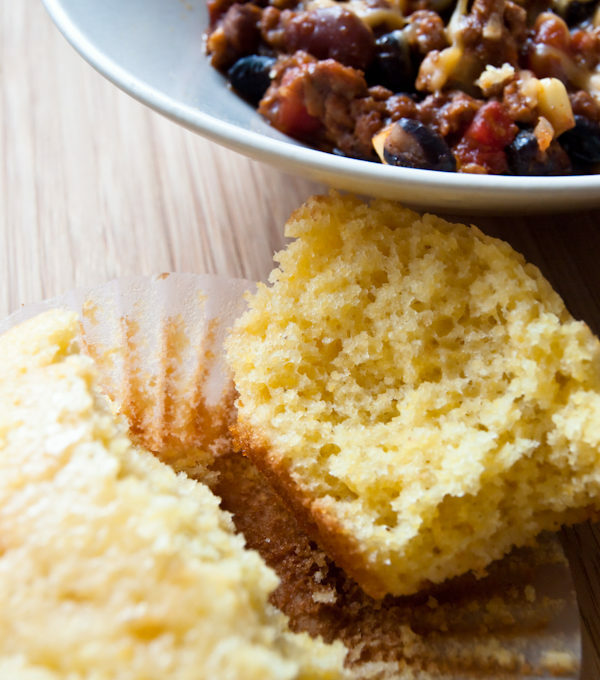 The chili sounds delicious, love the cornbread in the photo. Put on my chili? sour cream, grated cheddar, diced white onion, sliced scallions (green part for color). Thanks to Lauren Somers, your recipe has been passed around and enjoyed by tons of my friends and family. Lauren gave me this recipe so I could make it for my engagement party last year. Since then, I’ve gotten email requests for the recipe and continue to make it for my family. We all love it! I always use ground turkey, brown the meat with the onions, garlic, and spices before adding the rest, and use a tad more salt. Just thought you’d appreciate knowing how well loved your recipe has become! Claire – How sweet of you to share this story. We love to hear about which recipes inspire our readers and how you modify the recipe to make it your own. The ground turkey sounds like a delicious, lean protein option. With the weather getting cooler, I’m inspired to cook up my first pot of chili this season! Thanks again!